THE CAFE DE LA MARINE - All visitors to the Exposition probably noted the building with many gothic spires that is portrayed in the engraving. It was a fish and oyster house - therefore the euphemism of the Cafe de la Marine - and it may be taken as the leading example of restaurant architecture on the grounds. 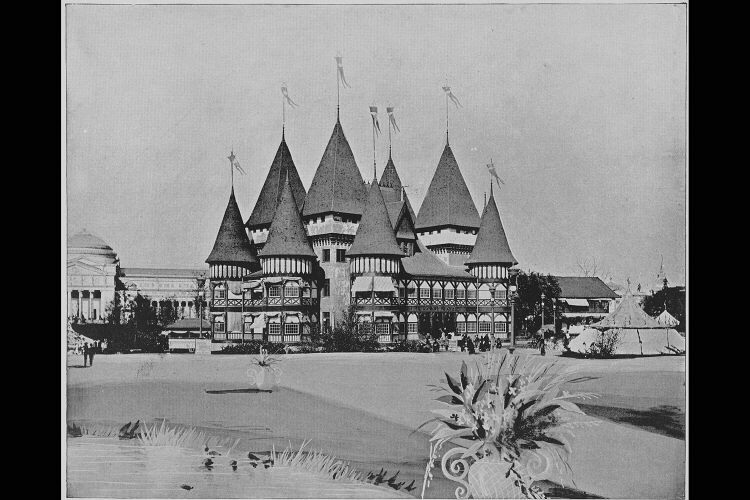 The great buildings were furnished with lunch-counters, and the same concessionaire also conducted several eating-halls - notably in Horticultural Hall, the Dairy Building and the Electricity Building - but concessions were also sold to proprietors who built additional edifices to fill the park, and these structures were nearly all ranged in a line reaching from the Cafe de la Marine to Victoria House at the lake shore. At the side of the marine was the Japanese Tea House; next eastward was the Swedish cafe; next eastward the Polish Cafe; next the "Banquet Hall"; next the Clam Bake, and lastly a soda pavilion. When the Cafe de la Marine was in course of construction a hurricane blew down part of the Manufactures facade and strained the cupolas of the Cafe. The chief of construction condemned the building; but, after examination and reports by several committees, the concessionaire was permitted to carry his picturesque house to completion, and it proved to be entirely worthy. Many clubs and associations enjoyed their banquets on its broad verandas, overlooking one of the finest scenes the eye could behold.